Sometimes you just have to embrace your girly side and your long-lost childhood dream of being a prima ballerina. I immediately fell head over heels (or should I say toe box?) when I saw these light pink, pointe-inspired ballet flats (complete with bow) by Melissa Shoes. As you might remember, Melissa Shoes are my absolute favorite for traveling and exploring European cities. They are the only stylish shoes I can spend the day in walking miles or standing in a museum without my feet hurting. Like all Melissa Shoes, these are PVC. Yes, plastic! So the added bonus to them be soft and squishy is that are basically indestructible and waterproof, which is essential on European cobblestone. I have never ruined or worn out as many shoes as I have in Italy. I have worn my Melissa Doris flats (currently on sale!) all over Italy/Europe so I was hoping these would be just as comfortable and cute. And they did not disappoint! These have even more cushioning and I think the design is just the right about of whimsy, while still being a versatile shoe. I cannot wait to wear them in Paris. My only caution with Melissa Shoes is that you need to wear them with tights or ballet socks. Remember they are plastic, so not the best shoe for heat and humidity lol. I paired my amazing new flats with my favorite lace tights to highlight the little black bow. And since I love to experiment with mixing prints and patterns, I decided to go for a little lace-on-lace action. 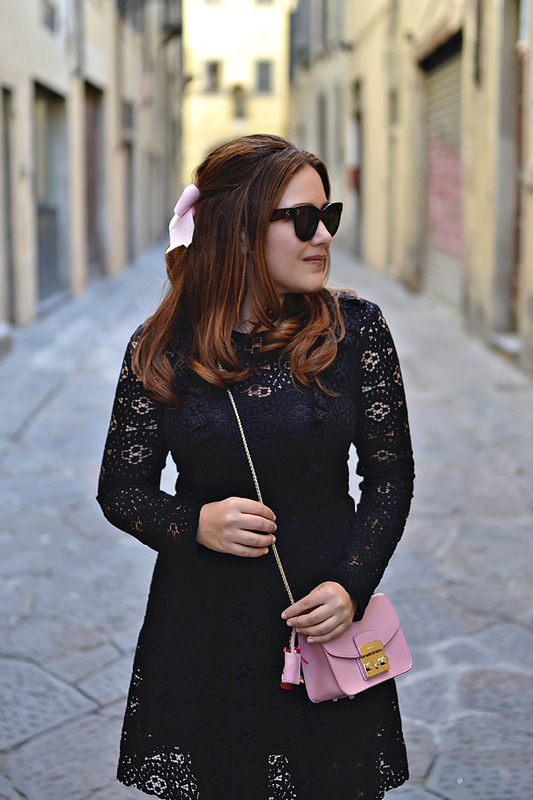 To break up the amount of black, I added my favorite light pink mini bag and a pink ribbon in my hair... because you know, childhood dreams.